Rake and brush over lawns to clear them of debris. Apply fertilizer when growth starts. Sow or lay turf for new lawns. This is the time of year when grass starts to grow away vigorously. The lawn will need your full attention now, particularly if has not had any attention in the winter. The lawn should be raked and mowed as follows. Rake vigorously, first in one direction and then another, to get rid of any accumulation of dead leaves and moss, then brush over with a stiff yard brush to scatter any worm casts. This will also bring the blades of grass upright ready for mowing. With growth just starting, mower blades should be set fairly high at about 2.5cm (1 in). You can lower the blades later, when growth is more rapid. Now is a good time to trim lawn edges, using a sharp, half moon edging tool. Stand on a plank placed alongside the edge of the lawn as a guide, to ensure a straight edge. After cutting, the edges of a lawn can be kept tidy using a mechanical edger or shears for the rest of the season. Towards the end of March, give the lawn a good feed with a special compound lawn fertilizer that contains a high proportion of nitrogen. This will provide a good green sward that will be strong enough to withstand any drought later on. Feed the lawn on a warm day after there has been a spell of rain and the soil is moist, but the grass dry. If more rain is forecast, postpone the operation. Make sure you distribute the fertilizer evenly; special hand distributors are available-or you may end up with scorched and patchy growth. Some fertilizers have a special colourant in them so you can see where they have been applied. If you have dug over an area to be turfed or seeded this spring, now is the time to finish the soil preparation. Choose a day when the soil is fairly dry; working on a waterlogged soil is a hopeless task. Break up the rough clods of soil and remove any rubbish, stones and perennial weeds. Rake the surface to a fairly even tilth, apply a compound fertilizer then rake again. Most lawns suffer from a build-up of moss and debris in the winter and now is the time to tackle it. The important task is to scarify (rake) the lawn to haul out all the old, dead grass, moss, and rubbish that has collected at the base of the sward. If allowed to remain, it can quickly form a waterproof layer on top of the soil that prevents rain from reaching roots. You can either scarify using a wire rake or if you have a very large lawn area there are several electric scarifying machines on the market. Spiking can be done after scarifying if the surface of the lawn has become compacted, enabling water to drain away properly, and allow air to circulate amongst the roots. An ordinary garden fork will do a perfectly adequate job unless the lawn is badly compacted, in which case use a purpose made hollow-tine fork. After spiking apply a top dressing of sifted soil at the rate of 1 kg per m 2 (2 lb per sq yd) and brush well in. Then treat the lawn with a combined moss killer/fertilizer, if required. 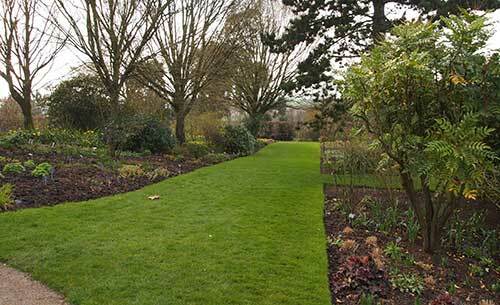 March is one of the best times of year for laying a new lawn, either by laying turf or by sowing seed. Lightly fork over and prepare the site by treading down (not rolling) the surface, then lightly raking it to create a fine tilth ready for sowing this month, if the weather is mild, or April. This can only be done when the soil is fit for working. All deep digging should have been carried out earlier in the winter to give the land time to settle naturally, so that the ground will be level.